Gardening and Growing in the Sedgwick County Extension Master Gardeners Demonstration Garden! ← My Favorite Mexican Seasoning Mix! Unfortunately, due to the amount of snow that piled up last week and the beginning of this week, I didn’t get more pictures of the garden until yesterday. You can see that the snow on the beds nearest the building has already started melting significantly, but that the far end is still piled and drifted with snow. It should be a good amount of moisture (and protection) for the garlic and shallots for the time being. It’s kind of nice having a winter that looks like winter for a change. Normally I would have a few teaser pictures from the Outdoor Living & Landscape Show to share, but again, I didn’t get my camera down there yet. I’ll probably have a few pictures next week. Meanwhile, you can find out anything pertinent about the show here: Outdoor Living & Landscape Show. The list of seminars is there as well. I'm a Horticulture Educator with Sedgwick County Extension, a branch of K-State Research and Extension, located in Wichita, KS. I teach about fruits, vegetables, and herbs. Posted on March 1, 2013, in Around the Garden, Upcoming Events and tagged classes, gardening classes, snow, upcoming events, weather, winter. Bookmark the permalink. Leave a comment. 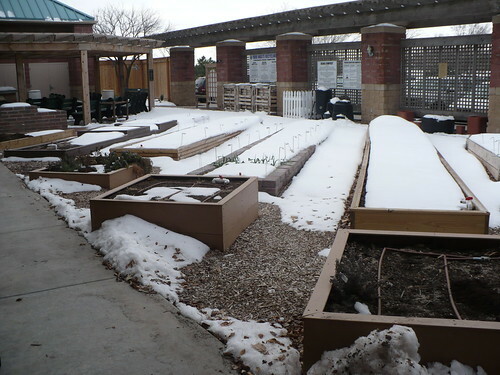 The Sedgwick County Extension Master Gardeners' Demonstration Garden is on the grounds of the Sedgwick County Extension office in Wichita, KS. Come see what's growing in our gardens! Orange Balls in My Cedar Tree? ?